The last time I was in Cornwall was when R and I got married – 2 years ago. Time and money always tend to get in the way of me making the 800 mile round trip. 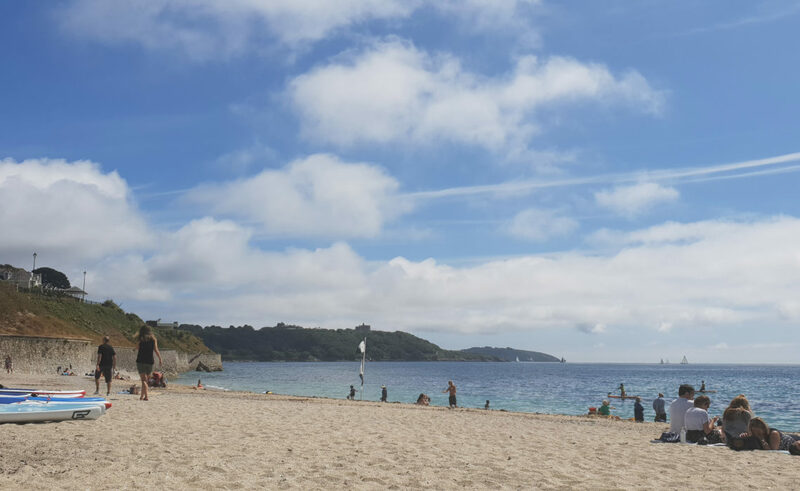 But eventually I couldn’t stand it any longer and hopped on a train to take the 9 hour trip down to my favourite place in the UK – Falmouth – to see some old friends and have a couple of days to myself in the sun. I usually stay with friends when I go down but this time I didn’t want to impose, and wanted a bit more control over my schedule, so I booked a room in the Gyllyngvase House hotel. I got myself a cute little single with a shared bathroom, which was all I needed really. The hotel was old and a bit musty, but clean, comfortable and quiet, so it served me well. In fact, I spent the majority of my time sitting in the garden in the sun, reading an Ursula Le Guin novel. I also caught up with my 2 favourite Fal people, Ilka and Laura, met Laura’s lovely fella Dom, had dinner at the Jakes with an old pal Rich, and spent some time sunbathing a Gylly beach. The sun was so hot I burned in about 10 minutes, leaving me with an embarrassing case of trucker arm. I also had lunch at my favourite cafe – The Courtyard Cafe – picked up a couple more books at the famous Beerwolf Books, and spent a couple of hours shopping in Truro. Overall it was a really good visit: quiet, calm, sunny and restorative. Exactly what I needed. And next time I go down I’ll be able to fly and rent a car, which will give me a bit more freedom to visit some of the other places I love in Cornwall, such as Kynance and Trebah.